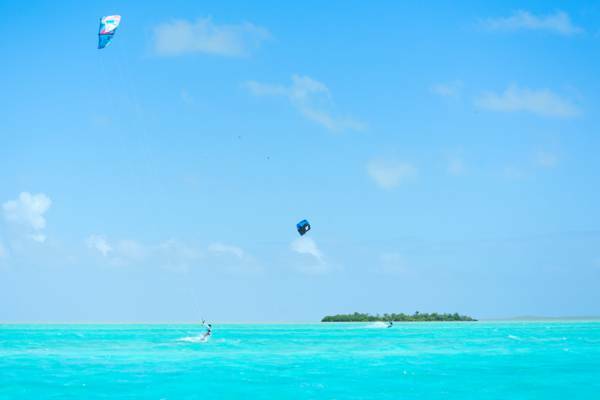 Professional kiteboarder Hope LeVin in the waters of Long Bay, Providenciales. 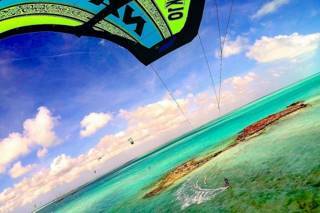 Long Bay Beach on Providenciales is one of the best places in the region to learn to kite. The water here is clean, clear and shallow. Experienced riders will appreciate the expansive flatwater off Providenciales and the other Caicos Islands. Local kiteboarder Hope LeVin on the flat waters of Half Moon Bay. 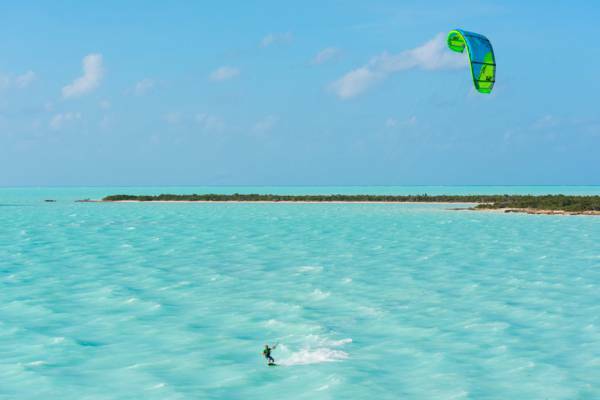 Kiteboarding (or kitesurfing) is becoming one of the most popular watersports in the Turks and Caicos. At the excellent Long Bay Beach on Providenciales, there can be dozens of kites in the air on a windy day. Here we will give you a run down on locations, conditions, and where to start if you want to learn. Kiteboarding is a simple wind powered water sport, which uses a large specialty kite, a harness that attaches the kite to the kiter, and a board, of which there are several basic types. The kite itself is of course the primary piece of equipment. The most common and easiest to fly is type is the inflatable kite (also known as a ‘tube kite’), which has an inflatable bladder on the leading edge of the kite for rigidity and buoyancy. Foil kites are also occasionally used on the water, mainly for low wind conditions. Twin tip kiteboarding boards, and inflatable edge kites. Kiteboarding boards are made specific for kiting, and are not borrowed from other water sports. There are three basic types, and many hybrid styles. The basic twin tip board is by far the most common variety. It’s the easiest to ride, it’s simple to change directions when riding, and it has foot straps, so it’s likely to stay on your feet! Twin tip boards are not typically large, yet they are training and light wind models when additional buoyancy is needed. Strapped or strapless surf style boards are also popular, yet take more skill and training to appreciate. Foil boards are the latest evolution, and are amazing. As their name suggests, these boards have foil wings, much like a hydrofoil boat, which lift the kiter out of the water when travelling at speed. Foils have by far the steepest learning curve, yet when mastered offer a surreal experience, with unrivalled speed, smoothness, and quiet. The third critical piece of equipment for kiteboarding is the harness. Harnesses are typically simple in design, and essentially redistribute the power of the kite to the kiter, so there’s not a constant strenuous fight with the kite. As may be expected, harnesses incorporate a quick release, in the case of emergencies! The most predictable and consistent wind on Providenciales is the east southeast trade winds. The islands typically experience this wind on and off over the year, but it’s usually a bit more pronounced and regular in the winter months. Squalls and regional storms occasionally cause different wind directions, which make north and west coast locations more viable. However, these winds are uncommon and unpredictable. What’s the Best Time of the Year for Kiting? Purely from a kiter’s perspective, November through May probably offers the best wind. Keep in mind that the average wind differences between the months isn’t great, and top conditions may be had at any time of the year. The weather in summer may be hot, however, disregarding the unlikely event of a nearby hurricane, conditions tend to alternate between perfect breezy kiting days and completely calm conditions. The windless days, where the ocean may be glassy, are unparalleled for scuba diving, kayaking and stand up paddle boarding, so there’s no limit on fun things to do. There may be other considerations on the best time to visit as well, including the budget and crowds. There are currently no laws or regulations against kiteboarding on any beaches in the country. Due to the spectacular setting and safe environment, we advise that any kite new comers to the Turks and Caicos start at Long Bay Beach, regardless of skill level. Long Bay Beach is the best kiting spot on Providenciales. The Turks and Caicos typically gets an east southeast wind, which Long Bay is directly exposed to. The water here is consistently shallow with a clean sandy bottom, which makes it an amazing spot for those new to the sport. It gets quite busy at Long Bay on windy days, and it’s not uncommon to have more than twenty riders out on the water. Leeward Going Through at the northeast point of Leeward Beach can be good for those who like to explore, as many small cays and coves can be found to the east. Due to currents and boat traffic, this area is not recommended for beginners. When the ocean swell is higher than usual, the best wave riding spot easily accessible from shore on Providenciales can be found a little west of the point. Due to the typical east southeast winds, Grace Bay usually isn’t the best beach for kiting. Unlike Long Bay, the water here quickly becomes too deep to stand and high resorts near the beach can cause wind disruptions. The best kiting spot in the area is found off the Grace Bay Forbes Point access next to the Sands Resort. Grace Bay is the busiest beach on the island, so be aware of boats and people. As with Grace Bay Beach, wind will typically be offshore at the Bight Beach, although due to lower building density wind obstructions are less of a problem. Crowds and boats are also less of an issue, attention is still required. Everything considered, we don’t recommend that beginners kite here. The Children’s Park access area has the widest beach and the fewest kite hazards. Kiteboarding instructor Wes Matweyew of Big Blue Unlimited. Providenciales does have other locations, but they are probably not appropriate for most kiters new to the Turks and Caicos. Chalk Sound National Park is highly scenic, but not great for kiteboarding. Because this lagoon is surrounded by hills and buildings, the wind is usually gusty. Also, nearly the entire coastline here is razor sharp iron shore. It will be difficult to launch and land, and your gear will very likely be destroyed if you crash! Northwest Point, Malcolm's Road Beach and West Harbour Bluff are also beautiful locations, but the wind will usually be offshore and these areas are often deserted. If you have any problems, you could likely drift until you hit the Bahamas or Bermuda! Heading to North and Middle Caicos for a day trip can be a great way to kite at some beautiful deserted spots. Although North Caicos has some great beaches, Middle Caicos has more interesting kiting locations. Bambarra Beach offers the tamest conditions, with clean shallow water. Casuarinas trees (usually locally called “cedars”) grow along the beach thickly, so be careful when launching and don’t crash! 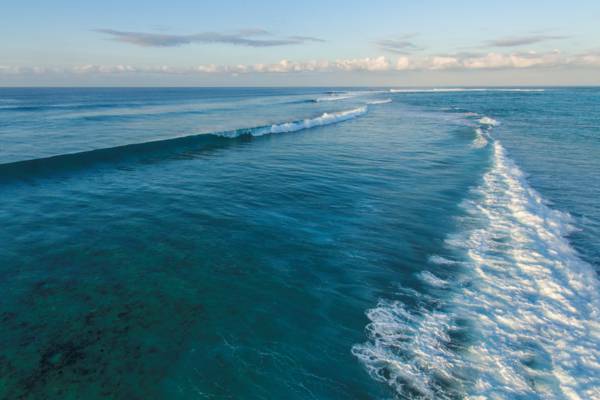 The stunning Mudjin Harbour and Conch Bar Beach can have large waves and will be a location you’ll never forget, but only advanced kiters should venture here. Along with rough conditions, much of the coast is razor-sharp ironshore, and it can be very difficult to get back your starting point if you get blown downwind. Hammerhead sharks are also sighted here here! The remote Cedar Point and Wild Cow Run can be amazing locations. A shifting sand bar forms a sheltered flat water lagoon in this area, and the turquoise water east to Dickish Cay and Joe Grant Cay is highly scenic. Breaking waves on the barrier reef. When the Turks and Caicos experiences a little bit bigger than usual ocean swell, several spots around Providenciales become decent wave riding locations. The easiest wave location to access is a small area found off of Leeward Beach, a little west of the Leeward Going Through access. Here, three to six foot waves break a few hundred feet from the beach when there is an ocean swell. Due to the absence of coral or rocks, this is the best spot for someone unfamiliar with the island. Cuts along the barrier reef located on the north side of Providenciales typically offers waves of two to four feet (.6-1.2m). During storms the swell rises up past 10ft (3m). Depending on the wind direction, the reef is a five minute tack out. A safety boat should be present, and caution should be taken when riding the reef as the changing tides may expose coral. Be sure to let someone know when you go out. Northwest Point can also have large waves, but due to the winds almost always being off shore, coral and rocks in the water, and the difficulty of access, Northwest Point is suitible only for experienced riders familiar with the area. Learning to kiteboard at Long Bay Beach, Providenciales. Over the past few years, kiteboarding has expanded greatly on Providenciales, and now there are several schools with many instructors teaching lessons for beginners and expert instructions for more advanced riders. Lessons are usually 1-3 hours, and initially involve learning how to fly a small trainer kite. Once the basics are mastered, the student moves on to the real deal and goes out on the water, refining their technique. Typically you'll start learning to kite downwind, and later progress to kiting upwind. Many schools offer packages, and it’s possible to be riding on your own after 3-6 lessons. Lessons are normally offered for ages 10 years and up and cost approximately $100-175 (2017) an hour. Complete beginner packages run at about $500-800 (2017). The local kite schools rent also rent kiteboarding equipment, but proficiency must be proven (some business charge extra for a basic test). Rates are about $30 per day for boards, a little over $100 per day for kites, and $650 per week for a complete package. It's best to book direct with a local kiteboarding school. Along with usually getting the best price, wind conditions can change, and it will be easier to adjust your reservation if need be. 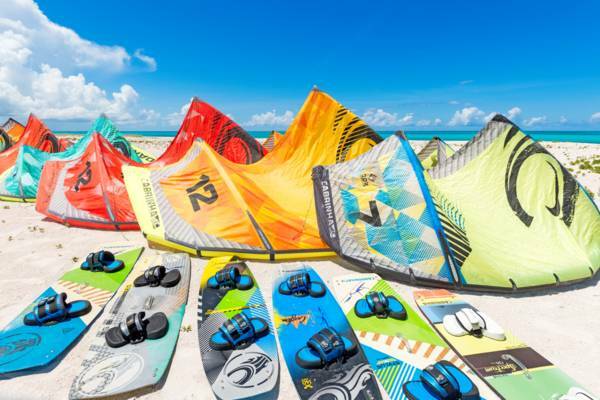 Blue Surf Shop in the Saltmills Plaza is currently the main retail shop for kiting equipment on Providenciales. Kite Provo and TC Kiteboarding offer equipment repairs. A kite safari down-winder in the Caicos Cays. Several of the local kite businesses offer eco-friendly kiteboarding safaris. 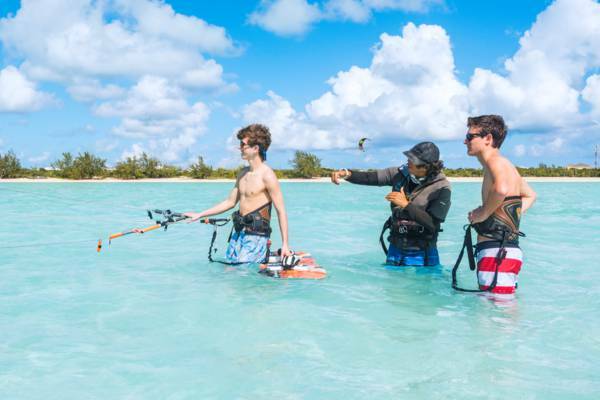 These excursions may simply visit remote and incredible kite locations that are only accessible by boat, or can be down wind expeditions that lead through the uninhabited Caicos Cays back to Providenciales. On the way down through the shallows and cays you’ll often spot interesting wildlife, including lemon sharks, stingrays, turtles and bird life, in addition to the unbelievably-turquoise ocean water. 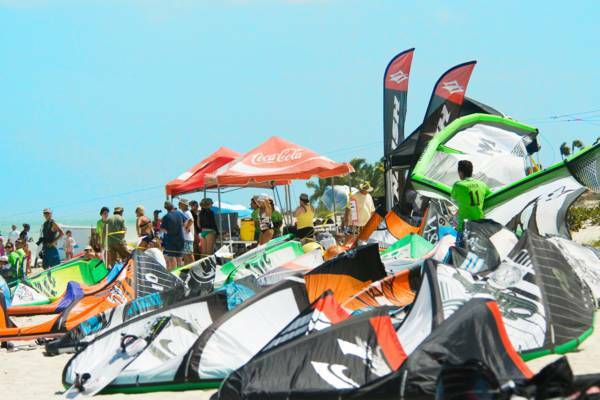 For over 10 years, Hope LeVin and the kiteboarding community hosted the Windvibes Kiteboarding Tournament. This had been an annual event here on Providenciales since 2007. Originally just kiteboarding, the competition has expanded to included kayak and SUP racing, windsurfing, log-throwing contests and tug-of-war. An excellent event for adults and kids alike. The last Windvibes was held in 2016 and the event has been discontinued. Kites at the annual Windvibes Kiteboarding Tournament. Are you interested in learning to kite? Big Blue offers professional training at the unrivalled Long Bay Beach on Providenciales. For those already up and on the water, our exploratory downwinder through the turquoise water of the Caicos Cays is an amazing experience. Last reviewed by an editor on 19 October 2018.